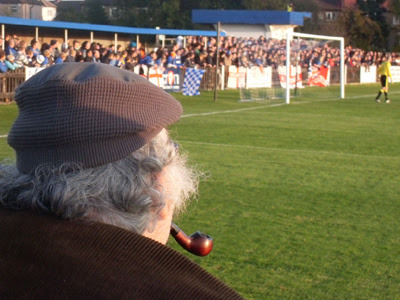 This site has been covering the formative rounds of the FA Cup for some years now, both in a Havant & ‘Ville context, as well as a neutral ‘ain’t non-league wunnerful’ bent. There is a danger with this though, that one might start to repeat oneself, creating one’s own clichés in the attempt to avoid others. So, for a change, let’s keep the flannel to a barest minimum and simply say this: FA Cup 1st Round Proper. Non-league side at home. League side visiting. You know how it works by now. 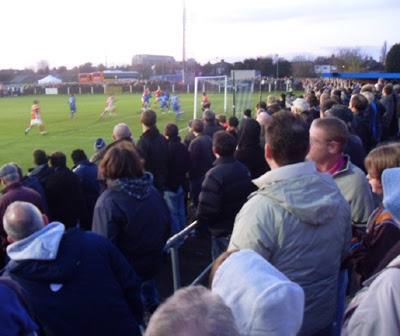 Wealdstone were winning the Conference twenty-five years ago this season, two years before that came with an automatic right to a leg-up over the wall, but within four years they were relegated and have not been back since. They lost their old Lower Mead home in 1991, and shared with Watford, Yeading, Edgware Town and Northwood before taking the opportunity to take over Grosvenor Vale, from Ruislip Manor. The place certainly required a bit of love to get it to Isthmian Premier League standard and it’s certainly feels a lot tidier and shinier than when I came to watch Manor here just prior to their departure to Tokyngton. That was only 18 months ago but that night the place looked so tired, the turnstile doors were being held open with matchsticks. Now, with a lick of blue paint around the fixtures and fittings, a few crush barriers on the far end terrace and, well, sixteen hundred extra punters, the place feels a lot more alive. 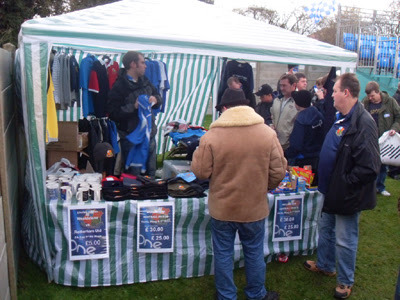 Then again Wealdstone have always carried themselves with a certain spirit (some might say a little too much on occasions) to keep them going through two decades of ground sharing, so it is perhaps no surprise that the place gives off a more pronounced joie de vivre. From afar, one gets the impression of Rotherham United’s support as being quite down to earth, despite their club’s problems with administration and being locked out, seemingly permanently, from their ground. Perhaps you need to live in Yorkshire to get a true impression but as a group they appear as inoffensive as a Postman Pat plotline (if we ignore the one where Mrs Goggins joins the National Front). Certainly that’s the impression one would take from their turnout at Grosvenor Vale anyway. They displayed their civic pride regularly, singing “You’ve only come to see the Millers” and “York-shire! York-shire!” wholeheartedly, before a lone voice behind the goal cut through the nithering autumnal air, bellowing “I’d rather be Welsh!” by way of sniffy retort. In the end, the tie turned out to be a great example of exciting FA Cup football but the first half wore a much dourer look, like one you might find slapped across the mooey of a jaded post office teller, for the first half hour at any rate. One of the ITV cameramen became so bored, he forgot which programme he was on and started following the swoops and dips of a pigeon in flight across the ground and, in doing so, missed a Rotherham header looping onto the roof of the net. Turning to the production assistant sat behind him, he wore a grin so sheepish, a farmer began whistling for his dog to bring it into line. 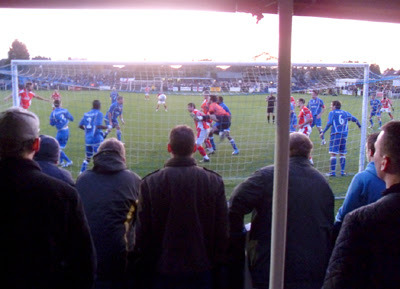 Having stood strong for half an hour, Wealdstone eventually gifted Rotherham the lead, keeper Sean Thomas aiming his clearance straight at the prowling arse of Adam LeFondre, whose charge down caused the ball to ricochet into the back of the empty net. At half-time the Rotherham support looked quietly buoyant, as is their apparent style. “Don’t be daft cameraman, get a picture of a proper crowd” said one jazz-handsing middle-aged Yorkshireman, realising he was just out of shot. For the home crowd, and us neutrals, the cold bit that little bit harder, the game not exactly meeting our expectations for the occasion. 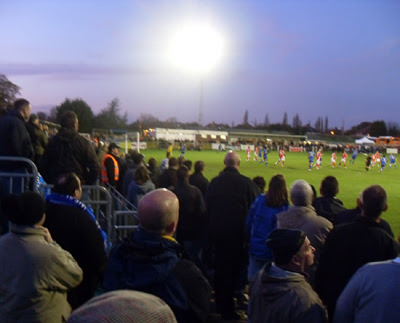 However, knowing that their club had been without a decent cup tie in quite some years (their last tie against a League side occurred in 1986 when they drew at home with, then lost away to, Swansea City), the Wealdstone players came out with the clear desire to get amongst the game and just after the hour, they had their goal, Ryan Ashe unleashing a handsome half-volley into the far corner past Andy Warrington’s dive. 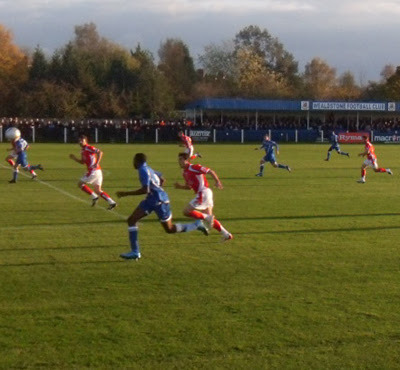 As Rotherham came under a lot of pressure, Wealdstone sub Danny Spendlove missed a gilt-edged chance while Lee Chappell’s free-kick from the edge of the area caused Warrington to clutch at the ball above his head like a man trying to keep on a Stetson during an unexpected gust. Just as it looked as though an equaliser was inevitable though, Rotherham delivered their suckerpunch, Drewe Broughton’s flicked header creeping in with seven minutes to go. However in the final minute, as the crowd was slowly filtering out, Ashe received the ball from Spendlove and curled a shot over Warrington to bring the score the deficit back to a single goal. For the five minutes of injury time, Wealdstone laid fervent siege upon Rotherham’s half but the equaliser was not to come and we were left with valiant defeat for the underdogs. This, as much as the odd giant-killing, is kind of what the FA Cup is all about. Sounds like another vintage cup occasion. Love the pics of all the fans pressed up against the barrier and the Wainwright-type geezer with his pipe. That'll probably be my lot for this year as there will be increasingly fewer options that don't clash with H&W fixtures. It was so much simpler when it was us in the 'propers'!